I’ve had my share of gaming injuries. Alongside the calluses and cramps that extended play sessions can produce, I’ve suffered Tempest-induced Dry Eye, and only narrowly escaped a tendon inflammation brought on purely by the Dreamcast controller’s right trigger. I’ve never broken a bone (don’t scoff – some have) but these days I’m more careful. For long Guitar Hero sessions I employ a second person whose job it is to massage some feeling back into my arms between bouts, and before loading World of Warcraft I take a few steps to RSI-proof my desk, one of which, surprisingly, is to convert the stationery drawer to a mousemat. I’m not too offended, then, by the unhealthy reputation games have developed – I know too well the migraines, backstrains and nausea they can cause. And I know too that the thousands of hours I’ve spent on the sofa make it harder to be sceptical about gaming’s role in rising obesity levels. Thanks, however, to active games like DDR, Eye Toy and Wii Fit, that reputation is starting to change. There’s little doubt, too, that gaming’s power as a motivational and education tool, will increasingly come into play, with products like Nike+ and games like Fatworld helping players towards a healthier lifestyle. But while it’s one thing for games to shake off their unhealthy aura, it’s quite another for them to be seriously considered as medicine. Increasingly, however, it’s clear that they should be. It’s nearly a decade now, since the first research was started into the idea of using virtual reality games as a form of pain control for burns patients, and in that time a solid body of evidence has built up, with patients reporting a 90% decrease in the pain they experienced when using the system during the game. Researchers at Manchester are also finding that virtual environments can be very useful for treating patients suffering from “phantom limb” experiences following amputations. Just as interesting is new work going into examining gaming’s potential for treating psychological problems. The US Department of Defense has funded three separate programmes investigating the use of virtual reality systems to help treat some of the many Iraq war veterans who return home with post-traumatic stress disorder. 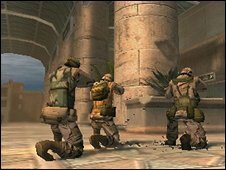 One, Virtual Iraq, is based on the game Full Spectrum Warrior, itself funded by the military as an infantry training tool, indicating how entwined key areas of public spending are becoming with games. Virtual Iraq provides a safe environment for patients to revisit the sights and sounds they associate with their trauma, gradually allowing them to normalise their reactions to them in every day life. Over the last decade this approach has also been used successful with Vietnam veterans, and victims of the September 11th attacks. Games don’t only come into play in such catastrophic circumstances, however. They are also being used to treat migraine, based on research into neurofeedback treatment techniques. Patients use sensors attached to their scalp which read brain waves to control a spaceship on screen, and while the exact mechanism still isn’t well understood, the system seems to offer a real step forward for drug-free pain control for sufferers. And, as software tools like Beating The Blues become available on the NHS, it likely won’t be long before you find yourself coming home from the doctor’s with a prescription for a game rather than a course of pills. It’s also increasingly likely that soon your doctor won’t just be prescribing games, but being trained by them, too. Games like Pulse!! use an FPS game engine to provide a virtual clinic for training doctors and nurses to deal with the injuries caused by large-scale natural disasters or on the battlefield, and research has shown that surgeons who frequently play ordinary videogames make more than a third fewer mistakes in simulations of laparoscopic surgery than those who don’t. Games are already finding a role at every point along the healthcare chain – training doctors, providing treatment for patients, and strengthening preventative medical efforts. So while I’m still asking for troubling playing Mythos till three in the morning with a spine like an ampersand, my nose three inches from the screen and a red-hot line of pain from my left-mouse-button-finger to my elbow, I’m confident that in the end, games will cure, not cripple, me.